The ToughBuilt Framer Pouch transforms how professional framers carry tools and supplies. The patented ClipTech Hub allows this pouch to clip on and off any belt. And the integrated kickstand allows it to stand upright on the ground close at hand. It fits ever-changing needs, keeping tools and supplies where they are needed, when they are needed. Its 9 pockets including 3 large-capacity pockets with No-Snag Hidden Seam construction, always-open pry bar loop, and extreme-duty hammer loop meet the demands of the professional framer. With rugged 6-Layer Construction and heavy-duty rivet reinforcement this reliable pouch withstands the most rigorous working conditions. Finally, a tool pouch built for electricians. This 20-pocket pouch features a new handle and padded shoulder strap design for easy carry and easy storage. And the pockets are made to fit the tools that real electricians use. Built-to-last with a double layer of rugged, lightweight DuPont<sup></sup> Cordura<sup></sup> Plus fabric. Milwaukee Work Gear is Nothing But Heavy Duty. Designed with professional tradesmen in mind and built with 1680 Denier Nylon, Riveted Seams and All Metal Hardware, Milwaukee work gear is up to 5X More Durable than competitive products and provides users with unmatched Durability, Comfort and Organization. The 3-Tier Material Pouch provides users with 13-Pocket to organize their bulk materials and tools. A plastic lined puncture-resistant pocket allows users to store sharp objects, such as jab saws, without worry of damaging their bags. The integrated handle allows the bag to be easily transported from and task to task and the incorporated belt slot allows the pouch to fit onto belts up to 3 inch wide. This combination of extreme durability and functionality confirms Milwaukee's commitment to providing innovative, durable solutions to the end user. Framer Pouch The ToughBuilt Framer Pouch transforms how professional framers carry tools and supplies. The patented ClipTech Hub allows this pouch to clip on and off any belt. And the integrated kickstand allows it to stand upright on the ground close at hand. It fits ever-changing needs, keeping tools and supplies where they are needed, when they are needed. Its 9 pockets including 3 large-capacity pockets with No-Snag Hidden Seam construction, always-open pry bar loop, and extreme-duty hammer loop meet the demands of the professional framer. With rugged 6-Layer Construction and heavy-duty rivet reinforcement this reliable pouch withstands the most rigorous working conditions. Framer Pouch is rated 4.7 out of 5 by 19. Rated 5 out of 5 by Brad from This tool belt is super high-quality. I was pleasantly... This tool belt is super high-quality. I was pleasantly surprised. Ordered online and had not seen it in person… Very happy with the product. Rated 5 out of 5 by CJ from Excellent pouch for the bigger jobs. Well organized. I love the toughbuilt system as well. Was re... Excellent pouch for the bigger jobs. Well organized. I love the toughbuilt system as well. Was really apprehensive about the interchangeable clips, but they have worked amazingly and hold up great. Seems like every time I turn around I either have too much storage or not enough on my belt, so I just swap a pouch here and a holster there and boom, back to work. Can't recommend highly enough! Rated 4 out of 5 by SolarPirate from Very nice, sturdy, durable pouch. Solid build quality. I found it to be too stiff and bulky for m... Very nice, sturdy, durable pouch. Solid build quality. I found it to be too stiff and bulky for my frame and needs and I opted instead for cheapo poly AWP pouches. 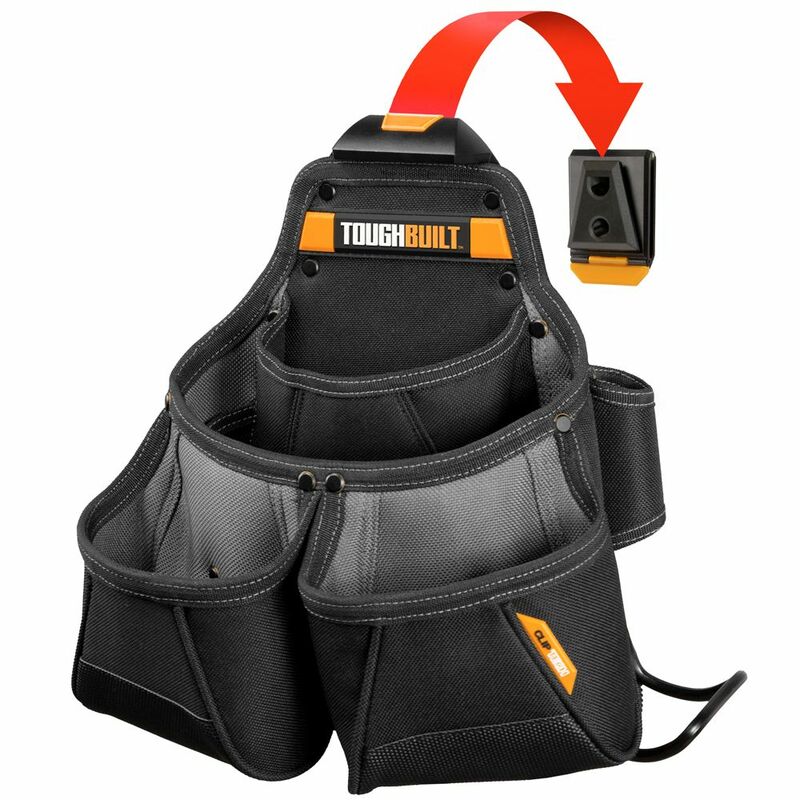 If you like the Toughbuilt tool belt system then I'd recommend this pouch, but if you're like me and want a simple light-weight tool belt then go with cloth or poly. Rated 5 out of 5 by Lee from Great stuff , I fully Recommend !!... Great stuff , I fully Recommend ! !